Obsidian black with Dinamica/Artico leather - Black, 1 Former Owner with Full Mercedes Service History and Just Serviced at 42k miles, Massive spec with Premium Pack! SPECIFICATIONS INCLUDE :- Panoramic glass roof with sun-blind, 20" AMG 5 spoke alloy wheels, Memory pack, Privacy glass, Aluminium running boards, Aluminium roof rails, Powered tailgate, Electric heated folding mirrors, Intelligent light system with Bi-xenon headlights, Cornering lights - LED daytime running lights, Rain sensor windscreen wipers, AMG suspension, Active park assist with parktronic system, Reversing camera, Attention assist, Electrically heated adjustable front seats with memory, Multi function 4 spoke nappa leather sports steering wheel with gearshift paddles, Bluetooth interface for hands free telephone, Collision prevention assist, COMAND HDD Navigation media interface, CD/DVD/MP3, 7" screen, voice control, 10GB music register, memory card slot, 8 speakers, Cruise control, Ambient lighting + More! 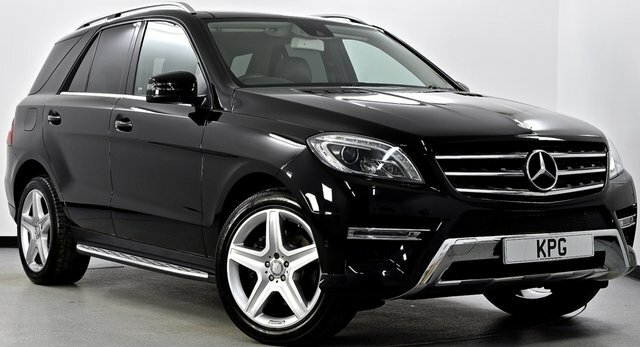 Get the best deal on a used Mercedes-Benz M Class car for sale in Bathgate by making your way to Kaim Park Garage Ltd today. You'll find every available model listed here on the website, and as all our stock is competitively priced you should have no problem sourcing a pre-owned Mercedes-Benz to suit your budget. Take the opportunity to browse our current range online before contacting a member of the showroom team to find out more. Our friendly and knowledgeable staff will be more than happy to answer any questions and provide advice and guidance when necessary. Alternatively, why not pay a visit to our showroom in person and take a closer look at the selection of used Mercedes-Benz M Class car models for sale.